Our founder Amanda Griffiths would love to see if she might be the right fit for a project with your health care organisation! Please go to our consulting page or mail consulting@myhealthcareer.com.au to start the conversation. We’re on track to reach half a million unique website visitors in 2019, so be sure to download our media kit on our advertising page. 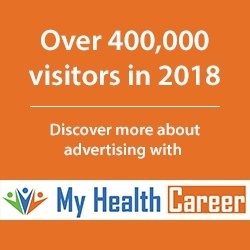 Email advertising@myhealthcareer.com.au so we can see if we might be the right fit for your campaign. Considering coming to Australia? Email international@myhealthcareer.com.au and we’ll do our best to steer you in the right direction. Considering a career in health? We are excited that you are looking at a career in health! Please note that we are health professionals, and unable to give individual advice on your career goals. Please contact a career development practitioner, careers advisor or guidance counsellor. We hope you find a career that’s perfect for you!